I started using a newsletter in our business about eight years ago. Initially, it was just a bit of a lark, it seemed like a fun thing to do to stay in touch with our clients and customers. I had been looking through a newsletter that came as a result of my daughter’s involvement in the local symphony. It was a fun read, some great articles, and I sensed that it was accomplishing something that we were lacking in our business. It was a way to develop community. It will keep you at the “top of their mind”. It will make you appear friendlier and more approachable. People LOVE to know who they’re doing business with. Most businesses think they are in business to sell things. Actually, you’re really in the relationship business! Because our demographics for this business include 95% female, we always include a fun, original recipe for them to try out at home. Sometimes we would incorporate something we sold at the shop, but most of the time, we did absolutely, positively NO ADVERTISING on the FRONT PAGE!!! Do you think you can’t use a newsletter to help your clients and customers be better informed? I write newsletters for a LOT of businesses, and there isn’t a single one who hasn’t benefited from writing a helpful newsletter. Why? Because it made their clients and customers feel like they were special. Once we started our newsletter, people would come into the shop and rave about the newsletter. They said it made them feel so special and they loved the articles and recipes, and timely/helpful tips and hints that we always tried to include. 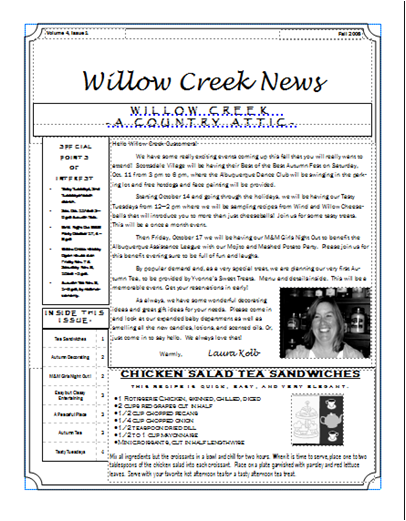 The next post will show you the inside of this four page newsletter, providing more examples of the type of things you may wish to include in your newsletter. Until then…think about your clientele. What do they want from you? How can you help them best? Is your competitor doing anything that you’re not? How can you change that? What do you wish all your clients knew?